For awhile now, I've kept all our extra food out on some chrome shelving in the garage. This worked out ok because the kitchen isn't too far from the garage but we recently took on an unwanted boarder who helped his fury little self to some of our dry goods. I also noticed that certain items weren't staying fresh out there, even when they weren't opened. We are about to finally fix our garage for good (I hope) so I asked the dear hubs if he wouldn't mind if I threw in a little project before we started on the garage and he agreed it was a good one. I'm now the proud new owner of an awesome custom pantry. This was my first big drywalling job so I'm not thrilled with how the cubby turned out on the end but I'm glad I did it, I'm sure once I figure out what to do with that space, it'll look really neat. For now, it'll sit empty until inspiration hits. I'm thinking of creating a command center but I'm afraid it'll get cluttery looking. The finished outside dimensions of the closet are 102 inches long by 15 inches deep. I built the space just slightly deeper than an Ikea Billy bookcase because I was able to get the two tall ones off Craigslist for $30. I picked up the center one in the as-is section at Ikea for about the same price. The two tall ones had no backs on them so I took the backing off the short one. I prefer to see the wall through the shelves anyway. Would you believe those awesome jars on that lower shelf there are also from Ikea? I'm sure you know what that means - the didn't cost an arm and a leg. They're part of the new Korken line (I think it's new anyway) and they start at $2.99 each. There were three different sizes available at my store in Renton, WA. As you can see, the cucumbers I grew in my garden have been turned into pickle. Yum! If you've been following this blog for any length of time, you've probably picked up on the fact that I don't pay full price for anything so I promise to do a post dedicated solely to the barn door track hardware really soon. All the parts were from either Home Depot or Lowe's so the setup most definitely did not cost me an arm and a leg. As I said, I'll dedicate a separate post to the hardware and will be sure to include lots of detail pictures. I'm absolutely loving how this turned out. UPDATE: Here's that how-to post! Oh wow! This is unreal! So beautiful! 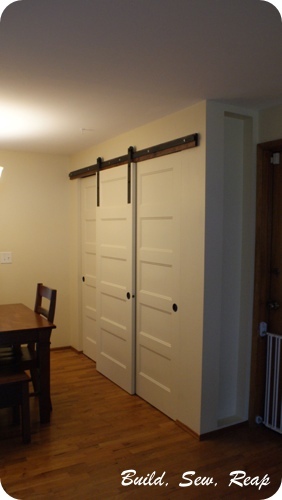 I can't wait to hear how you made the rolling barn door--love it! 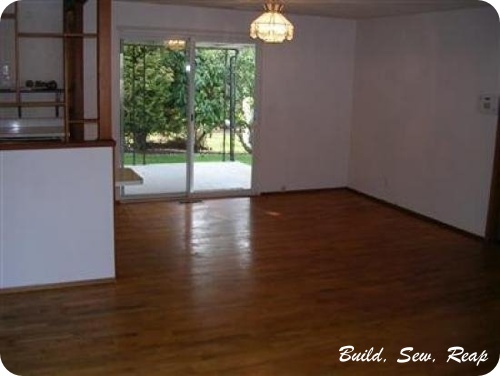 You have accomplished so many projects this summer! Hi Mia - thank you for your comment. I will work on that post, I got swept up in daily life again. 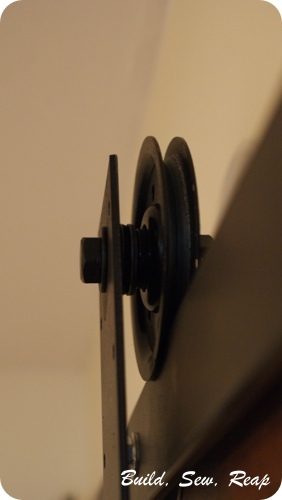 In the meantime, order yourself two of the garage door pulleys I have linked to below. I believe these are the same as the ones I used for the wheels. The groove should be 1/4 inch wide, if so, you will then need a steel bar (or two) that is 1/4 inch thick to create the track. Everything in my setup is coated with black spray paint with a light dusting of brown to give it the desired softness. Thanks so much Michelle. Yes, I've been busy this summer. I'm so behind in blogging too, I have a million little projects to document. 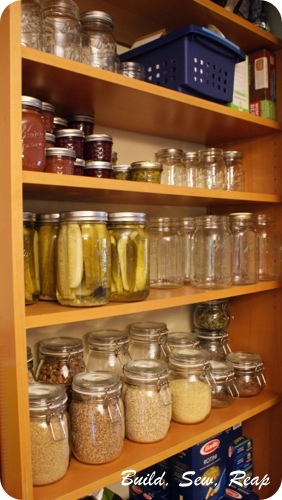 This pantry is exactly what we needed. My only complaint is that the toddler helps himself to the snack box when I leave the door open. He certainly keeps me on my toes. Thanks for stopping by. I should add that the two back doors are on a standard 2 door bypass track. There is a relatively large gap between the front diy door and the back closet track door but it works fine in our house because nobody stares at the pantry from the left where it is obvious. I'll include pictures when I do the how to post but hopefully that gets you on your way. Hooray!! I know how it can be when you're chomping at the bit to do a project but can't figure out how to do it. I will work on that other post as soon as possible, hopefully tonight. It is partly done but I've been super busy around here preserving all our garden bounty and other veggies I've been acquiring from neighbors and friends. I'll make that post a priority though. Thanks for sharing on the link party! Totally showing the hubs your how-to; want to use an old garage door for a bathroom door & don't want to spend $350 for a kit! Love! Thanks for stopping by. 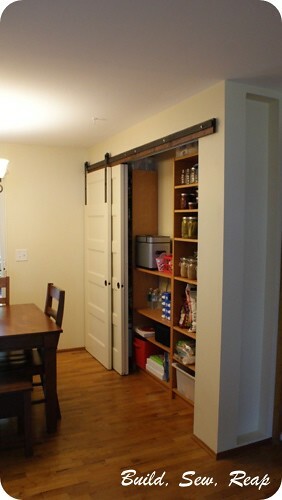 I fell in love with the barn door idea and it was just too perfect to have a doorway that could open so wide for our pantry. I was determined to make it happen and although it took a lot of trial and error (or maybe because it did), I'm thrilled with the end result. My kids are getting crazier and crazier with the doors and we haven't had a single mishap so I truly believe the setup is really safe too. Let me know how it goes if you attempt it as well. Good luck!! 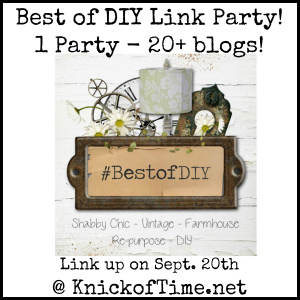 I'm still making my way through all the links shared at the Best of DIY link party and noticed yours - I love your barn door pantry! Thanks so much for linking up at the party!